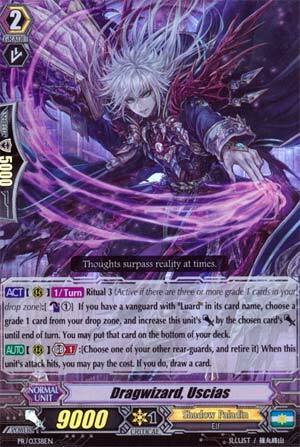 [ACT](RC)[1/Turn] Ritual 3 (Active if there are three or more grade 1 cards in your drop zone):[Counter Blast (1)] If you have a vanguard with "Luard" in its card name, choose a grade 1 card from your drop zone, and increase this unit's [Power] by the chosen card's [Power] until end of turn. You may put that card on the bottom of your deck. [AUTO](RC) Generation Break 1:[Choose one of your other rear-guards, and retire it] When this unit's attack hits, you may pay the cost. If you do, draw a card. Speaking of retiring, on the opposite end of the spectrum (and field, and by extension target audience), Uscias here can facilitate a field cleanup to replenish hand, as long as he hits that is. The first skill makes it a bit easier, but given the G1 lineup in most Luard decks, you're looking at "CB1 to give me 7k power. I can now make 16k without a booster". Throw a 7k booster on top of that, and you're looking at a 23k column before triggers. A fair cost to be sure, but I'd rather all this Counterblast go into something a with a bt more substance to it, unless for whatever reason I have a lt of open damage. Useful enough placeholder for those not fond of 10k vanilla Grade 2s.